This tour brings you to the most distinguished temples in Bangkok visit Wat Trimitr, the temple of the Golden Buddha – the statue of Buddha is made from solid gold weighting 5.5 tons, Wat Pho, the temple of the Reclining Buddha – the largest and oldest in Bangkok, Wat Benchamabopit – the marble temple. Meet our staff in your hotel’s lobby. Depart for Ayutthaya By AC Bus. Visit Wat Traimit (Temple of the Golden Buddha) this is the world’s largest solid gold Buddha, cast about nine centuries ago. The image is three meters high and weighs five and half tons. 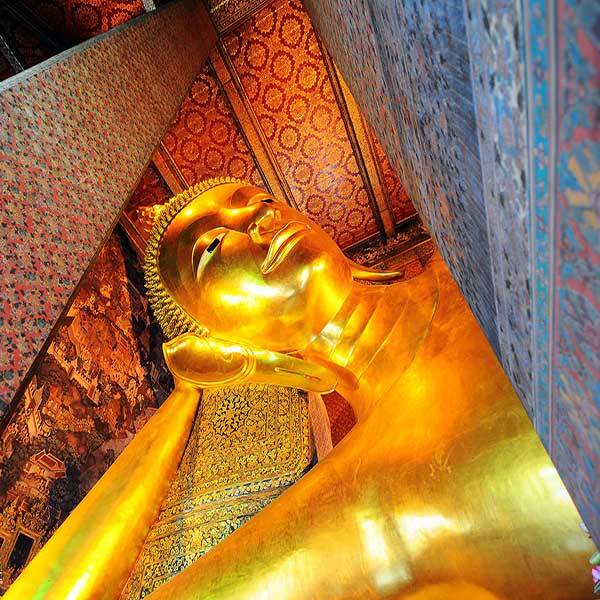 Visit Wat Pho (Temple of the Reclining Buddha) it is Bangkok’s oldest and largest temple. The gigantic gold plated reclining Buddha with inlaid mother-of-pearl soles is highly revered among Buddhists. Visit Royal Grand Palace & Emerald Buddha. This city landmark should be the first place on any visitor’s itinerary, which features some of the most spectacular architecture in South East Asia. The palace begun in 1782. It is a consisting of several building with highly decorated architectural designs. Visit Wat Phra Kaew (Temple of the Emerald Buddha) The magnificent Royal Chapel, Wat Phra Kaeo in the same compound enshrines the Emerald Buddha Image, most revered by people. Cross Chao Phraya River by boat to visit Wat Arun. (Temple of Dawn) The most attractive in this temple is the pagoda Khmer – style. Wat arun was restored during brief Thonburi period to be the Royal Chapel of King Taksin. Visit Wat Benchamabophit (Marble Temple) the main building was constructed during the reign of King Rama V. Its interior is magnificently decorated with cross beams of lacquer and gold this is “the perfect architecture of Thai art”. A large collection of bronze Buddha images lines the spacious inner courtyard. Please Note **Please do not were short, sandals, no-sleeves T-shirts. Camera may not used inside the buildings. Any expenses that are not stated in the program. Racha Noi island is southernmost of Phuket. It has a wonderful beach where no more people ever seen that. It like a pirates beach. White sandy, crystal clear water, colorful fishes and corals hidden from people for long time.